What does our signature mean? The act of signing, besides granting documents validity and turning them into legitimate, defines us, since the signature symbolizes our inner Ego. It is almost like a “logo” for a company. The signature represents what we feel about our identity and how we feel about what we have achieved so far until present. It is very tied to the individual we would like to be, that is, our ideal Ego; it is more subconscious than the text. We all know how much companies invest in the logo development that will identify them. We should think the same way about our writing and especially in our signature. If you still write and sign like an adolescent, you should ask yourself if that is how you would like to be seen by the rest of the world. The signature is an introduction letter that sends subconscious signals about how you are and about how you see yourself. 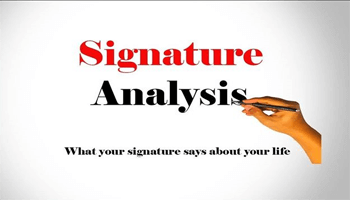 Signature Analysis Personality. The text symbolizes the way in which we conduct ourselves in life and how we wish to be identified. It is the image we present before others. The text is studied through the graphical aspects that we have mentioned several times, layout, shape, dimension, slant, speed, continuity and pressure that will reflect who we are today in our present situation and will also allow to infer the future behavior. The graphological study analyzes the signature and text as a whole, quite on the contrary, there would be information missing. In the signature, we project our deepest being, our personality. In the graphological test, the signature is analyzed after the other graphological aspects have been studied. It is very usual that our signature is modified throughout time and does not accompany us for our entire life, due to evolution and the maturity of our personality.